Progressing from my project last week, utilising some Robert Allen upholstery samples (purchased from a recycle centre for $1), I mentioned I have been scheming up a plan to use the rest of these pretty fabric squares. 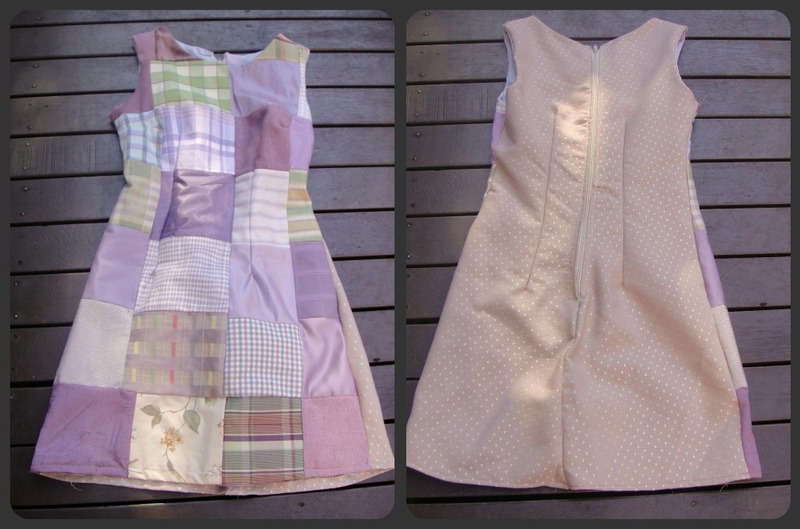 My second project is now complete; a patchwork dress. It has taken me the best part of a week to complete. I used a pattern I have from my collection; New Look 6577. 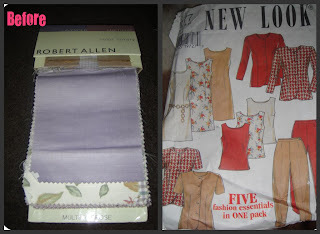 I discovered my thrifted pattern did not come with instructions, so I cut relevant pattern pieces, and winged it. There was not enough samples to complete a full dress. 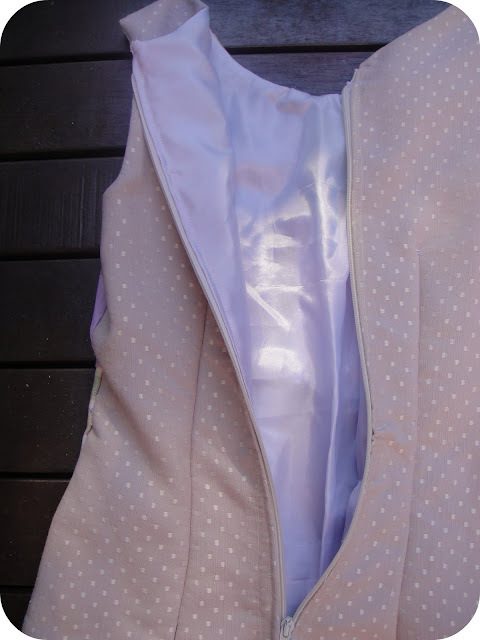 I thought I might have to buy (thrift) some fabric to match the upholstery samples, but instead, used what I already had; a pale pink fabric for the back of my dress, a light blue fabric for lining (although in photos actually looks lilac), and a reclaimed zip. This is the first time I have fully lined a dress, completed by trial and (a few) errors. When I first completed this dress, I had an awful big gape at the back of my neck. After googling for some advice, I'd either cut this dress pattern to the wrong size, have a narrow upper back, or both. I had to un-pick the zip, completely remove it, cut into the back (risky), and re-sew. Time consuming, but thankfully got it right the second time. I used leftover cut away patches to sew a fabric flower, backed with eco-fi felt, and hair grips, so that I can either wear it in my hair, or on a band around my waist. I chose a white silk scarf to tie around my waist as a belt, as I felt it looked a little plain without anything. I am so happy with this dress, but now have to find an occasion to wear it? Smart little cookie you.Last time I did patchwork on a dress was for my now 27yr old when she was little.You did a great job on yours. That dress is divine! Love it! I really really liked your blog! Love it! Congrats. I am not at all crafty but so admire it in others! That is an absolutely awesome dress! I love it. Love this, so pretty and cute. I'd never even thought of making a dress from upholstery samples, such a great idea and the samples are always in complimentary colours too. your dress is gorgeous! And, not to worry about the season, you will get a heap of wear out of it in summer, for sure! Sew clever. You need a granny spencer under to keep you warm. Gorgeous! I especially love the flower belt/hair piece. @lozzalea glad you asked. Sometimes, depending on the fabric, I'd manage to rip off the sticky paper, but most of the time I would cut the paper off completely; not using the bottom part of each fabric sample - I wish I had a magic solution to get rid of the sticky paper bits! 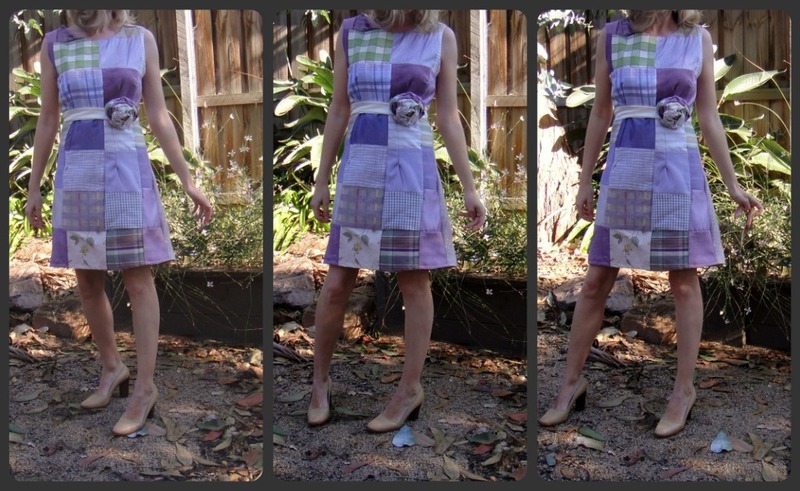 I love on how you made the dress from upholstery. This is really great and it could even be sold too. This dress is amazing! 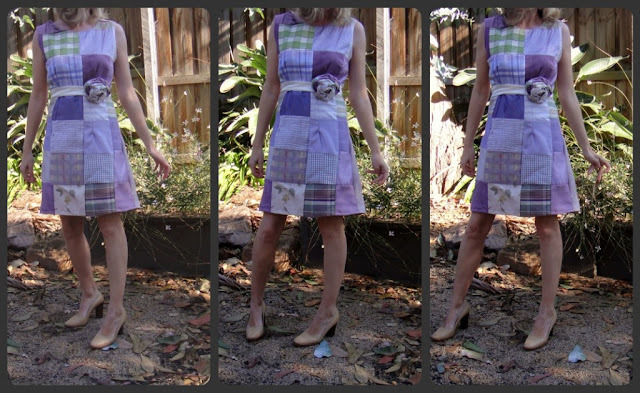 I'm convinced that I need a patchwork dress now.